Since most areas are under Stage 3 watering restrictions, primarily consisting of watering with an automatic sprinkler system once every two weeks, it is more important than ever to ensure that when your system runs, your yard is getting and absorbing as much precious water as possible. 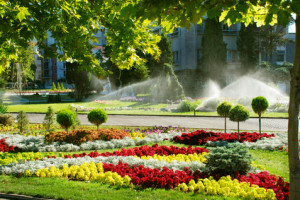 If you are trying to decide whether to water in the very early morning hours or the very late evening hours on your watering day (since watering is not permitted between 10am and 6pm), we recommend watering with a “Cycle & Soak” technique in the very early morning hours as wind is at its lowest point during this time. In north Texas, it still may be windy in the late evening and this will cause the water droplets from the spray heads to be blown away and the rate of evaporation will also be increased. Also, the peak heat of the day in the summer occurs around 5pm. Avoiding the peak or near-peak heat of the day is ideal. If you want to water again in the evening, plan it as close as possible to 11:59pm (8pm, 9pm, 10pm, and 11pm). The important thing is to make sure that the soil can hold this water so that it won’t runoff and be wasted. At our house, we water using the “Cycle & Soak” method. We use four cycle times: 12am, 1am, 2am, and 3am. During each cycle, we set the system to water each zone for seven to eight minutes. By the time the next cycle starts, the clay-rich soil is ready to absorb more water. At the end of the fourth cycle, each zone will have been watered for 28 to 32 minutes, with very minimal runoff. This saves us water and money!! At the end of May, the North Texas Municipal Water District (NTMWD) announced that they would extend Stage 3 watering restrictions, watering once every two weeks, through the end of the summer. These restrictions will be implemented through October 31st for the city of Plano.